The Seattle Genealogical Society celebrated a milestone this year, reaching the grand age of 95 on October 18, 2018. We thank you again for your generous donations in the past and request your support as we continue to improve access, lend assistance and supply resources to the ever wider community of those seeking to discover and preserve their family history. A few recent accomplishments:	The SGS Library has over 17,000 catalogued items and just this year acquired almost 400 new books. The library is open to the public six days a week at no charge. Come take a look! The library is now a FamilySearch affiliate. When you visit you may access, at SGS computer workstations or on your own portable computer, the extensive digitized microfilm records of the LDS Family History Library, many of them not generally available online. 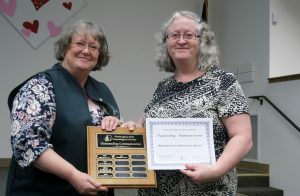 SGS launched successful online classes in introductory genealogy and DNA, and received an FGS Directors award for our nationally recognized online Certification Discussion Group Series. We’ll be rolling out a new website in early 2019 – watch for individual accounts for each SGS member, a convenient new page listing upcoming education and events, and exclusive online access to the indexes and databases our volunteers have been busy putting together this year. Our popular Seminars, Interest Groups, and Second Saturdays continue – next up: “Ins and Outs of Indexes” on Jan. 12, 2019, and our first-ever Japanese Genealogy Seminar, Feb. 2-3, 2019.Please make a tax-deductible contribution today to provide much-needed sustenance for SGS as we look forward to the even grander age of 100! Fill out the form below and return it with your check or money order. Or make your donation online with a credit or debit card at the link below. Check if you do not want your name to be published. Local genealogical societies and organizations, we’d love to publicize your events and meetings on the WSGS website and Blog. Gets the word out to your target audience in order to increase attendance or participation. Helps other local societies looking for program ideas. Web site: The “Meetings and Events” tab of the website lists upcoming events chronologically. You can also search for a key word or filter by category. The three most immediate events are highlighted on the right navigation bar on every web page. Blog: Every Thursday, more than 700 WSGS Blog subscribers receive a weekly digest listing all the blog posts from the previous seven days. That’s right…more than 700 people interested in area meetings, events, tips, and special features! WSGS wants to help promote your activities. Just send your meeting notice, workshop/seminar flyer or event news to WebManager@wasgs.org and WSGSBlog@wasgs.org and we’ll do the rest. We hope to hear from you! The deadline to name your 2018 Outstanding Volunteer is Feb 15. All we need by that date is the name of your honoree. To view other deadlines, click here. The Outstanding Volunteer and Outstanding Team Awards are presented each year at the Annual Meeting and Awards Ceremony to members nominated by their local society. Nomination criteria is left to the individual societies, but limited to two individuals or one team. This year’s Annual Meeting and Awards Ceremony will be at the Clark County Genealogical Society‘s Spring Workshop on Saturday, May 26 in Vancouver. Honor those outstanding members and teams that help your organization be successful. If you’ve got questions, contact Roxanne Lowe, Interim WSGS Recognition Chair. What – exactly – is a social media manager and does your society need one? Learn some tricks of this growing professional area and how to convert that to assist your non-profit genealogy society. Jen writes, lectures, and consults on a variety of genealogy topics. She is the Data Acquisition Manager, North America for Findmypast; and serves as a volunteer for the Federation of Genealogical Societies (FGS) as a Board Member and the Education Committee Chair. She served for several years as the Social Media Chair for the War of 1812 Preserve the Pensions fundraising campaign, led by FGS. Jen is also an active volunteer for the Larimer County Genealogical Society (CO), and has been the host of #genchat, a popular genealogy crowd-sourcing community chat on Twitter, for nearly four years. The webinar will be held on October 19, 2017, at 7:00 p.m. Central Time, and will be recorded for viewing on the FGS website shortly after its conclusion. Please register in advance. NEXT TIME: The topic for the November 16, 2017 webinar is “Building Bridges Between Societies” presented by Kim Ashford. Each month, the FGS Webinar Series will feature a new and interesting topic, ranging from recruitment and volunteer management to technology, publications, and working with your local tourism board. Webinars are held on the 3rd Thursday of the month at 7:00 p.m. Central Time. Advance registration is required. Regular updates will be shared via the FGS Voice blog, FGS Voice Newsletter, and social media. Report on the WSGS Board meeting. 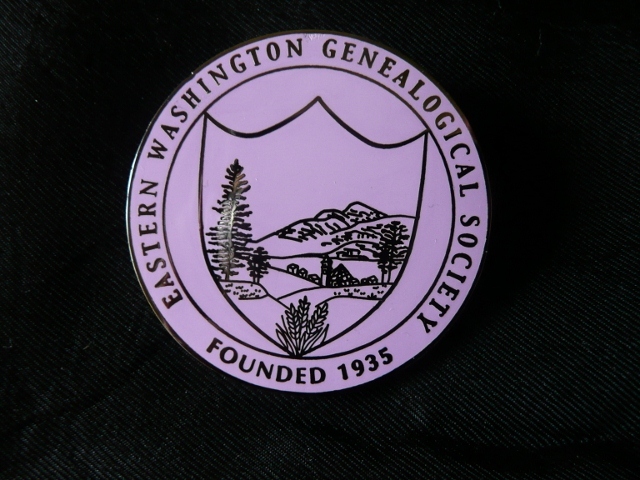 WSGS, the Washington State Genealogical Society, exists for one reason: To be of assistance to all the genealogical societies in the state. That mission statement was loud and clear at the recent Board meeting in Yakima. The Board consists of 16 good folks and 13 were present; that’s dedication. They come from all four corners of the state; Ginny Majewski, the president, comes from Sequim…. that’s a 500 mile round trip! The meetings are kept to agenda, business is accomplished, Parliamentary rules are followed, and everybody participates. It’s a good group! All projects, plans and programs were discussed. Website problems and updates were discussed. The use of ZOOM for virtual meetings (not just for this Board but any society in the group) was discussed. Questionnaires were sent to all genealogical societies in the state and Ginny is coordinating the returned into; to wit, how can WSGS help YOU? to create and maintain such a list. 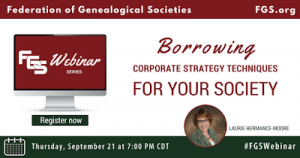 The webinar will address a variety of paths for a society to utilize the techniques of the corporate world. Many societies are at a crossroads: new competition from online genealogy sites and webinars, dwindling membership, and challenges in figuring out how to evolve activities. It’s time to stop and make a plan! So why not borrow from the business world? Marketing strategist and genealogist Laurie Hermance-Moore will show you techniques that are used by large companies to refine how they “go to market.” Learn how to align your society leadership to your vision for the future, your current mission, how you are positioning yourself against the competition, and identifying and prioritizing your target audiences. Laurie has more than 15 years of experience in marketing, marketing research, strategic planning, and brand development. She provides coaching to professional genealogists and genealogy societies in marketing strategy, so they can craft their unique story, target their offerings to the right clients, and build their confidence in marketing. The webinar will be held on September 21, 2017, at 7:00 p.m. Central Time, and will be recorded for viewing on the FGS website shortly after its conclusion. Please register in advance. 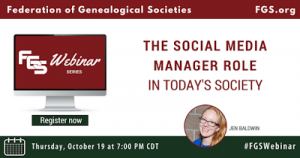 NEXT TIME: The topic for the October webinar will be “The Social Media Manager Role in Today’s Society” presented by FGS Education Chair Jen Baldwin. Are you looking for a rewarding and beneficial way to volunteer? The Education Committee at FGS could use your expertise. Please contact Jen Baldwin at education@fgs.org. On Sunday afternoon, August 27th, we all gathered at the lovely home of Patricia Bayonne-Johnson, president of the Eastern Washington Genealogical Society. “We” were the EWGS Board and all the committee chair persons. (EWGS made the leap a year or so ago to include the committee chairs at all our Board functions; make them know they’re needed and appreciating their input). President Pat had an agenda which she emailed ahead of time (and before that, asked for agenda items to be included). This meeting, this retreat, is the most important meeting of the EWGS Board and Committee Chairs all year. All the jobs and projects were discussed; every Board member and Chair person gave an update and report on their position, problems and projects. The biggest thing we accomplish at this meeting is to thrash out a roster of programs for the coming year. We feel it’s patently unfair to dump such a huge job on one person so everybody attending is expected to bring ideas. Once roughed out, the list is turned over to the program chair for implementation. This works wonderfully well for us. About mid-way through the afternoon, we paused for snacks, brought by everybody to share. Pat provided coffee and bottled water. We would 100% recommend this idea to you for your society management. If you do try this idea, I’d enjoy hearing from you as to how it helped. Local Society Management Classes Offered – Free! 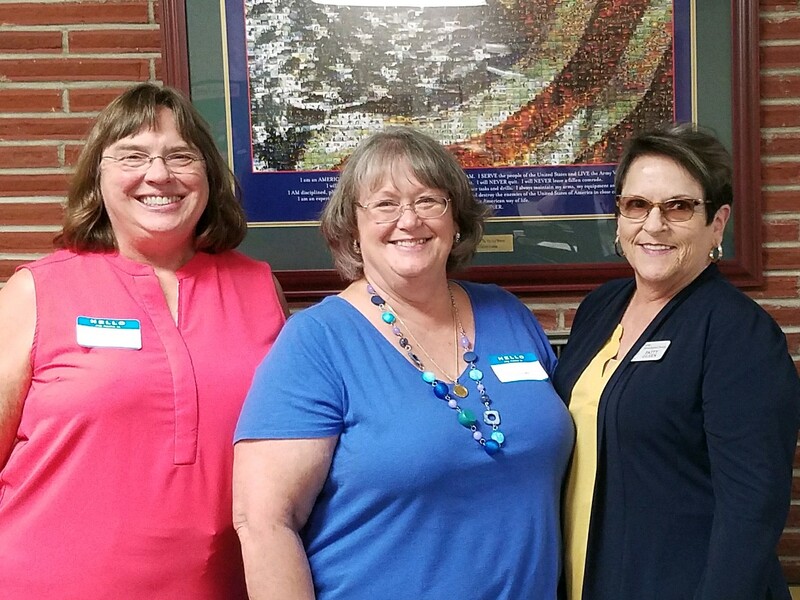 Ginny Majewski, WSGS President, recently presented her “Nuts and Bolts of Society Management” class to a group of local genealogists hosted by the Lewis County Genealogical Society. By all accounts, the class was well-received and packed with valuable information, as well providing answers to a lot of society management questions — and some questions that attendees didn’t even know to ask. Ginny’s “Nuts and Bolts” class is one of two society management classes being offered by WSGS on Wednesday, August 16, 2017, at the Northwest Genealogy Conference in Arlington, WA. The other class, taught by WSGS VP Donna Potter Phillips, is “How to Attract and Keep Members…Awake.” More information about the FREE society management classes is available in this Blog post. For those local societies not able to take advantage of the management classes at the Northwest Genealogy Conference, arrangements are possible to present the classes at a more convenient time and location. Contact Ginny for more information.